Scene from "War on Stones"
On a stony leasehold in the south of Italy, a father is showing his son how to build dry-stone walls to mark off the fields and clear the stones from the land so that it can be farmed. Watching his father's precise and seemingly effortless gestures, the son realizes that exercising a craft with anything less than total devotion will mean that it will be void of "vitality or life and so - devoid of beauty." Andreas Teuchert was born in 1970 in Tuebingen. He studied Literature and History in Frankfurt, Munich and Berlin, followed by Film Studies at the German Film & Television Academy (dffb) in Berlin. A selection of his films includes: Der letzte Vietcong (short, 1995), La musica seite voi, amici! 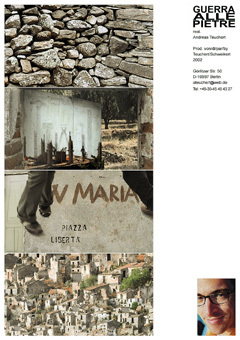 (1998) - a "making of" the film Sicilia!, and War On Stones (Guerra alle pietre, short, 2003).